Update 20 July 2017: This story originally reported that four bodies had been found in a tent, taking the year's death toll to 10 instead of six. However, Nepalese officials later confirmed that this information was incorrect and that no climbers had been reported as missing. This year's climbing season on Mount Everest has seen record numbers trying to reach the summit. But among the record-breaking attempts, there has been the familiar tally of casualties. The death toll so far this season stands at six, including an Australian, Francesco Marchetti; an Indian, Ravi Kumar, whose body was found on Monday; and 85-year-old Min Bahadur Sherchan, who died attempting to reclaim his title as the world's oldest person to reach the top. World-renowned Swiss climber Ueli Steck also died during an acclimatisation climb at the end of April. Everest's Hillary Step: Has it gone or not? Meanwhile, a 29-year-old Spaniard is being hailed as having reached the summit in the fastest-ever time, without rope or extra oxygen. Kilian Jornet reached the top, from the Tibetan side, in just 26 hours, his team said on Tuesday. The record cannot be verified until he returns. An Indian woman, Anshu Jamsenpa, is also believed to have set the new woman's record for the fastest double ascent, having climbed the mountain twice in one week. She will now have to approach Guinness World Records to register her climbs after they have been certified by Nepal's ministry of tourism. 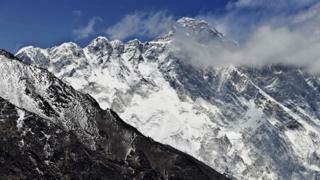 The Everest main climbing season is a short window of a few weeks, ending in early June with the arrival of the monsoon. Most climbers head up in May, although there is also a shorter opportunity later in the year. More than 382 climbers have successfully reached the summit from the south side so far this season, with at least 120 doing so from the Tibet side, according to Reuters news agency. How dangerous is it to climb Mount Everest? More than 200 people have died on Everest since 1920, with the vast majority of those deaths taking place since 1980. In fact, to find the last year without any known deaths, you have to go back to 1977. The deadliest season in the mountain's history was 2015 when 24 people died, mostly as a result of avalanches. Last year, five people died on Everest itself. However, the numbers of people attempting the climb have also skyrocketed since 1990, when the Nepalese government withdrew restrictions on how many teams were allowed on to the mountain - which means the percentage of climbers who die has actually dropped. Mountaineers on Everest die for a number of reasons - more than 20% are killed by exposure or acute mountain sickness. But according to statistics given to the BBC by the Himalaya Database in 2015, by far the highest number of people who died did so because of avalanches (29%), with falls being the next largest cause of death (23%). What happens to their bodies? The problem of what to do with those who lose their lives in remote or difficult locations is one that plagues the mountain. Bodies which can be retrieved are brought back down the mountain, but others are left on the snowy slopes and crevasses. Some bodies have been known to reappear as glaciers move. There are a number of notable corpses, including Francys Arsentiev, the woman who became known as "Sleeping Beauty". She lay where she died, wrapped in her purple jacket next to the main route, from 1998 until 2007, when her body was lowered down the side of the mountain and out of sight. There is more information about the so-called "graveyard in the clouds" here.